Electrosurgery is a useful, inexpensive, and a sometimes misunderstood form of surgical energy. A better understanding of the principles of electrosurgery can lead to more widespread use with greater safety. This article discusses monopolar electrosurgery as used by the author. Other forms of monopolar electrosurgery, such as argon beam coagulation and fulguration, will not be discussed. Power. This is the force behind the surgical energy. With a scalpel, it is the pressure applied with the hand to the cutting edge. With electrosurgery, it is a number that can be set on a dial in watts but which is actually measured in volts. With lasers, it is also a wattage set on a dial. Effective surface area. This is the area of the energy source which affects the tissue, or its 'footprint'. With a scalpel or electrosurgery, it is the area of metal in touch with the tissue. With lasers, it is the diameter of the spot of laser light. Power density. This is the energy which is delivered to the tissue and is the result of the effects of (1) and (2) above. The formula for calculating electrosurgical power density is straightforward: power (in watts) divided by effective surface area, or PD = W/A. A higher power density will produce a more concentrated effect than a lower power density, resulting in a 'sharper knife'. In electrosurgery, power density is sometimes referred to as current density. Electrosurgery is the performance of surgery using electricity, which is the flow of electrons. Many surgeons use electrosurgery exclusively, while some surgeons use photons, very commonly delivered by carbon dioxide (CO2) lasers. Electrons and photons share several common characteristics that are important in surgery. Both travel at the speed of light. Both have a tiny mass. Both carry energy that can be modulated by substances in their paths. Both can impart their energy to a receiving surface. Both can cut or coagulate tissue. There are important differences. Electrons are channeled within a simple electrical conductor, while photons can be carried in air or in a vacuum, or modulated by reflecting or refracting surfaces. Machines to generate electrons are relatively inexpensive while machines to generate useful photons are not. Photons cannot be used to palpate, retract, grasp, or rearrange tissue, unlike the electrical conductors which carry electrons. Because of these facts, in a world that places a premium on multipurpose, inexpensive technologies, electrosurgery has an advantage. Monopolar electrosurgery begins with an electrosurgical generator. Electricity (in the form of traveling electrons) flows out through a wire which is connected to some type of metal-tipped surgical tool (which is called the 'active electrode'). Since the metal in the wire and in the active electrode are good conductors of electricity, no heat is generated in the metal by the flow of electrons. Living tissue is not a particularly good conductor of electricity, so when the active electrode is touched to tissue and the electrons enter that tissue from the electrode, tissue resistance to electron flow produces heat. It is important to realize that the tip of the active electrode is not what gets hot (that would be 'endocoagulation'), it is the tissue beneath that gets hot, although heat in the tissue can eventually warm the active electrode tip. Heat in the tissue is what produces the various effects possible with electrosurgery. On this point, the tissue effects of electrosurgery are very similar to the tissue effects seen with the CO2 laser, since the collimated beam of photons produced by the laser also heats tissue. Once the electrons enter the tissue, they disperse rapidly away in all directions from the tip of the active electrode and find their way to the grounding pad (properly termed the 'return electrode') attached to the patient's skin. The circuit is completed as the electrons find their way back to the electrosurgical generator. Electrosurgical generators produce alternating voltage, so as soon as the circuit is completed, it begins flowing in the opposite direction, although for practical purposes the concept of electrons flowing out of the tip of the active electrode is accurate. There are too many instruments for any one surgeon to master them all. In fact, using too many instruments during surgery will slow its pace because of all the instrument changes that are required. A surgeon would do better to use one, two or at most three separate instruments exclusively and adapt their use as required to solve the surgical problem at hand. Another advantage comes if a single instrument can perform more than one function. For example, a 3mm hook scissors (Figure 1) allow the surgeon to palpate tissue, retract, grasp or rearrange tissue, cut sharply, cut with electrosurgery, coagulate bleeders and retrieve pathology specimens. If one of these functions was served by a separate instrument (such as a bipolar coagulator to control bleeders), the pace of surgery would slow down. Laparoscopic 3mm hook scissors allow fine, meticulous dissection. Size matters. The larger the instrument, the less precise surgery becomes. Small instruments bring the possibility of greater precision because of the ability to bring mechanical or electrosurgical energy to almost a pinpoint focus. The focus of equipment manufacturers on 5mm shafted instruments is unfortunate because surgery for endometriosis is extremely exacting when operating around all the various vital structures that can be affected by the disease. It would be very difficult to do precise electrosurgery with a relatively huge 5mm instrument with its much larger area of exposed metal. This focus on 5mm instrumentation is one of the reasons most gynecologists will not be great laparoscopic surgeons. Power density determines the tissue effect seen with electrosurgery. From the power density formula PD = W/A, we see that power density varies inversely with footprint of the electrode which is in touch with the tissue and varies directly with the wattage set on the electrosurgical generator. It should also be apparent that the same power density can be achieved with almost any combination of any watt setting and any electrode footprint, although most electrosurgeons use a specific range of watt settings that works for their style of surgery and the size of the footprints of the active electrodes they are using. The size and shape of the active electrode is very important in electrosurgery. For a given watt setting on the electrosurgical generator, the power density will be lower with a larger active electrode footprint. 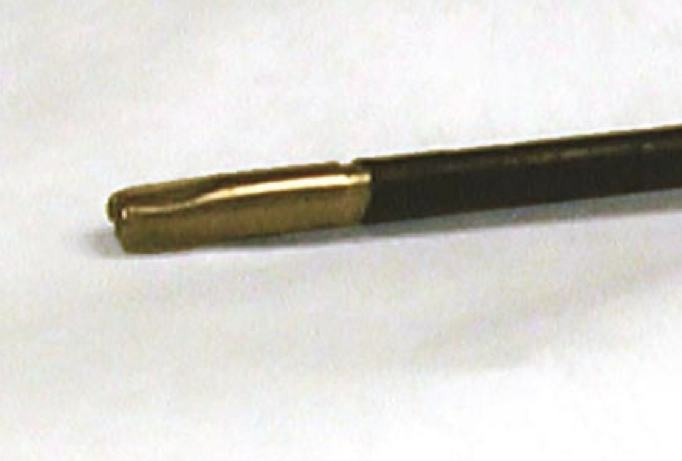 Examples of tools having a large footprint would be ball electrodes or almost any instrument with a 5mm shaft. At very low power densities, intracellular water and cells themselves will be slowly cooked, and the visual effect will be one of slow coagulation with sometimes significant lateral thermal spread indicated by white desiccated tissue. Examples of the use of lower power densities include tubal coagulation for permanent sterilization in females and hemostasis. If a surgical instrument with a smaller footprint is used, the power density will be higher. Examples of instruments with small footprints would be needle electrodes and 3mm scissors. Higher power density results in the instant boiling of intracellular water which causes the cell to explode. This results in a clean cut with little or no lateral thermal spread. Examples of the use of high power density would be making precise cuts into bowel, bladder or ureter. Power density can be varied by varying the footprint in touch with the tissue. For example, at a watt setting of 90, the power density delivered through the same 3mm scissors might vary from about 10,000W/cm² if just the point of a scissors tip is used, to about 139W/cm² if the broad side of the metal tip is buried into the tissue (Figure 2). Thus, cutting and coagulation can occur at the same watt setting by varying how the electrode is presented to the tissue. Figure 2. Schematic diagram showing approximate surface areas in square millimeters (top number of each number pair) and resultant current densities in watts per square centimeter (bottom number of each number pair) possible at a constant wattage using various presentations of the scissors to the tissue. The tissue effects will be different with different current densities. There are two main types of current used in electrosurgery. These are popularly called 'cutting current' and 'coagulating current', although these names do not restrict their use. Cutting current can be used to coagulate (by burying the metal electrode into or against tissue) and coagulation current can be used to cut (by using only a very small footprint). Cutting current is always 'on' and has a never-varying sawtooth type of pattern alternating continuously between the maximum positive voltage of about +500V and the minimum negative voltage of about -500V (Figure 3). This results in a peak-to-peak voltage of about 1000V. Since the waveform of the current as seen on an oscilloscope does not vary, the current is 'unmodulated' or 'undamped'. Figure 3. Waveform of pure cutting current, also known as unmodulated current. 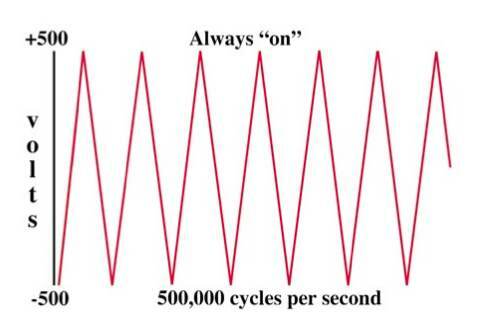 Coagulation current is 'on' only about 6% of the time and has a peak-to-peak voltage of about 5000V (Figure 4). The higher voltage results in a greater generation of tissue heat which is clinically useful for coagulation of bleeders during surgery. Since the waveform of the current varies from usually 'off' to occasionally 'on', synonyms for coagulation current are 'modulated' or 'damped'. Figure 4. Waveform of coagulation current, also known as modulated current. Blended waveforms are combinations of these two main waveforms. Just as there are too many instruments to become familiar with all, a surgeon who tries to use all waveforms will never master them all. It would be better to become familiar with the two main waveforms and adapt them to the surgeon's style and requirements. Sufficient power should be used to have the desired tissue effect as quickly as possible, just as a surgeon would favor a sharp scalpel over a dull one. Since low wattage settings result in low power density, electrosurgery will more closely resemble surgery with scalpel and scissors if it is used with higher power settings. Lower wattage settings can be associated with a greater degree of lateral thermal spread that not only can damage adjacent vital structures, but which can also distort local anatomy because of coagulation. Higher power settings will produce quick clean cuts when delivered through instruments with small tips. It is easier to repair a small clean hole than a large coagulated area. With 3mm hook scissors, 90W of pure cutting current and 50W of coagulation current are power settings that will accomplish almost all electrosurgical tasks. The length of time an activated electrode is presented to tissue is the dwell time. Monopolar electrosurgery can be made safer by using short bursts of energy delivered with superficial grazing strokes, almost as if the tissue is being sanded away. This is particularly true when the higher voltage coagulation current is being used. Safety can be increased even further if irrigation fluid is used to bathe tissue intermittently while it is being treated. Bathing the tissue is most commonly done during coagulation of bleeders, when the dwell time is intentionally longer. Monopolar scissors rarely would be used to gnaw through tissue mechanically while activated since this would present a greater footprint with a reduction of power density and degradation of the desired surgical effect. The 3mm scissors can be used most usefully as a point electrode (Figure 5), resulting in an increased power density and quick, certain tissue effects. Laparoscopic 3mm scissors in the closed position for use as a point electrode. Just as a radio transmitting tower emits electromagnetic radiation which induces electrical energy in the receiving antenna of an automobile, so does the active electrode and its wiring emit unseen electromagnetic radiation that may be picked up by surrogate metal 'antennae' inside or around the patient. Fortunately, such energization of nearby metal objects occurs to a fraction of the level that is generated within the active electrode itself, and the level of energization falls as the distance increases between the active electrode transmitter and the passive antenna receiver. Since a capacitor is represented by two conductors separated by an insulator, secondary energization of an accessory metal instrument is called capacitive coupling. In laparoscopic surgery, the conductors consist of the active electrode and the wire supplying it and any other nearby metal. Capacitive coupling seems to occur primarily when the active electrode is energized, and the capacitor system does not seem to store up a dangerous charge which can then be discharged even when the active electrode is not energized. Capacitive coupling poses a risk that is almost exclusive to bowel, particularly small bowel because it is so thin-walled. In the case of laparoscopic surgery, there are several possible forms capacitive coupling can take. The most obvious case is when the conductors are the active electrode and its supplying wire and an accessory metal instrument, while the insulator is whatever insulation is around the conductors as well as the gas distending the abdomen. In this case, the metal tip of the accessory instrument could theoretically become energized and transmit electrical energy into tissue which is being held or retracted. Since the footprint of the accessory instrument on the tissue may be rather large, and since it would be energized only to a fraction of the active electrode, unintended injury would be uncommon because the power density delivered to the tissue would be low. Occasionally, if the accessory instrument is inserted lateral to the inferior epigastric vessels, secondary energization of the instrument will stimulate a nerve which results in a spasm of muscular activity causing jerking of a leg. While this does not appear to injure a nerve, muscle sprain could occur with repeated episodes, so electrosurgery should be cautiously used if this happens. Another form of capacitive coupling occurs if trocar sheaths contain metal. Even if there is no active electrosurgical instrument within such a sheath, the metal in the sheath can become energized by a nearby transmitter. Since capacitatively stored energy is inversely proportional to the distance from the transmitter, this would rarely be a problem. If the sheath is entirely metal, then there will be a relatively large footprint of the sheath as it passes within the abdominal wall. This large metal footprint will cause dispersion of capacitatively stored electrical energy into the abdominal wall at a low power density, so unintended injury is unlikely to occur. If the sheath has a plastic component (which may be threaded) that passes through the abdominal wall and a metal component which extends beyond the plastic portion within the abdomen, the metal part of the sheath will have no way to discharge its energy back into the abdominal wall because the plastic component is not a conductor. If such an isolated metal sheath comes into contact with bowel during use of the active electrode, it could become energized and represent a potential risk to the bowel. 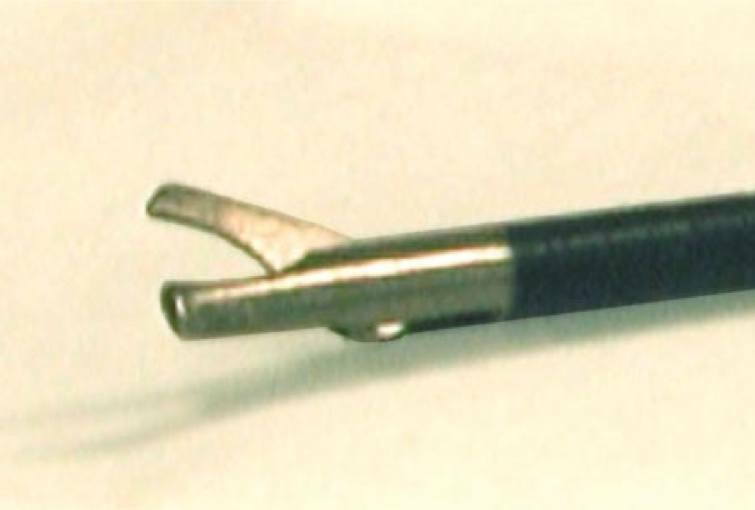 A special form of capacitive coupling exists when an active electrode is inserted down the operating channel of an operating laparoscope since the metal of the laparoscope itself can become energized. If the laparoscope is passed through a metal umbilical sheath, any charge within the laparoscope will be dispersed through the metal sheath's large footprint into the abdominal wall. If a plastic sheath were to be used, then the laparoscope could theoretically become energized, in which case, if small bowel were to touch a portion of the tip of the laparoscope out of sight of the surgeon, it could be burned if the power density were sufficient. Insulation breaks represent a potential for unsafe laparoscopy. Even if the insulation on an instrument is inspected before surgery begins, an insulation break can occur during surgery while the shaft of the instrument is out of view within a laparoscope or secondary sheath. While active electrode monitoring devices exist which can detect insulation breaks and automatically shut off the electrosurgical generator, not all hospitals have such equipment and it is not available for instruments with 3mm shafts. Nonetheless, there are three signs that appear during use of the active electrode that can alert the surgeon to the possibility of an insulation break: (1) Static on a TV monitor. (2) Twitching of abdominal wall muscles. (3) Declining efficiency of electrosurgery at a particular power setting. If any of these occur, the insulation of the active electrode should be checked. Any form of surgery has rules for safe use which the surgeon must understand. If a surgeon were to make an unintended cut with a sharp scalpel, a dull blade would not be substituted as a superior alternative simply because it would not make an unintended cut. He would understand that the problem was not the sharpness of the blade, but the way it was used. He would continue to use the sharp scalpel because it is more useful than the dull one. He would simply use it in the proper way. While it is claimed that bipolar electrosurgery is safer than monopolar, this is not necessarily true. Bipolar instruments require larger heads than monopolar devices, so mechanical or electrosurgical use of bipolar devices will rarely be as precise as surgery with smaller monopolar devices, such as 3mm scissors. Bipolar electrocoagulation can continue to drive electrons across the adjacent paddles in some circumstances even when the tissue is coagulated and completely desiccated, resulting in continued heat production. Many bipolar instruments are designed primarily to coagulate tissue by constant use over several seconds, which increases the duration of time required for their use and which can result in relatively wide thermal spread. One of the relatively unknown intrinsic safety features of monopolar electrosurgery is the increasing insulating effect of tissue during desiccation. Electron flow diminishes, then effectively ceases when complete tissue desiccation has occurred. Thus, there is an ultimate limit to damage that can occur from monopolar electrosurgery, even if an electrode were activated in a single location for a long period of time. In surgical practice, monopolar electrosurgery is used in short bursts, which increases its safety because the dwell time in any specific location is kept to an absolute minimum. Accordingly, monopolar electrosurgery can be used safely on or around the ureter, bowel, bladder, or vascular structures. Just as a hand can pass quickly through the intense flame of a blowtorch, so can virtually any vital structure withstand a short burst of electrosurgery. One of the myths of electrosurgery is that electrons will pass through the body in unintended and unpredictable ways, possibly following paths of least resistance which can cause unanticipated injury. This notion has no basis in reality. With electrosurgery, 'what you see is what you get'. If there is no visual sign of damage or thermal spread, then none has occurred. It must be remembered that although the current density or power density immediately beneath the tip of the active electrode may be quite high, the effect will be propagated in a hemispheric pattern in all directions away from the tip. This means that away from the tip the power density will drop off rapidly, as will the chance for any electrosurgical effect. The surface area (A) of a hemisphere is given by the formula A = 2πr². The formula for the power density (PD) at a radius, r, from the tip of the electrode becomes PD = W/(2πr²). 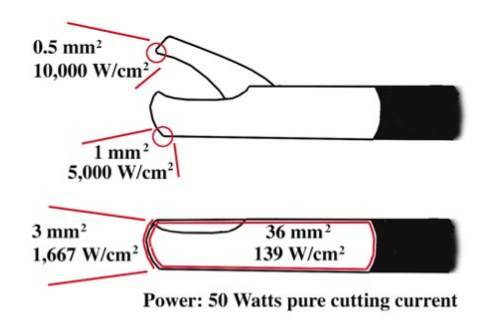 So for a power setting of 50W of pure cutting current, the power density at the very tip of a 3mm scissors may be 5000W/cm² (Figure 2), but 1cm away in any direction the power density would be less than 8W/cm² (Figure 6). This is too low a power density to cause harm, especially if electrosurgery is used in short bursts. Figure 6. As electrons enter the tissue from the tip of the active electrode, the current density is very high immediately beneath the electrode tip. As the electrons spread throughout the tissue in a hemispherical pattern away from the active electrode, the current density becomes much lower. This, along with the use of monopolar electrosurgery in brief bursts, makes this surgical energy form very safe in the hands of those who understand its use. While many surgeons treat endometriosis by monopolar or bipolar electrocoagulation, this represents a crude and imprecise form of electrosurgery. The footprint of the active electrode is intentionally large. 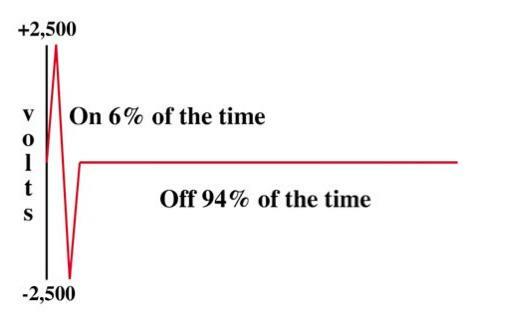 The dwell time is necessarily increased. The visual endpoint of surgery is uncertain since the depth of destruction is uncertain. Electrocoagulation of endometriosis suffers a much more serious problem, however, since it has never been described in the literature! For a surgeon to be able to effectively duplicate electrocoagulation of endometriosis, several pieces of information are necessary: (1) the type of electrosurgical generator used; (2) the power settings; (3) the type of active electrode used; (4) how that electrode is used; (5) visual endpoints of complete surgery. Since none of the influential papers on electrocoagulation of endometriosis provides these details, it seems impossible for any surgeon to use this modality consistently effectively. Most surgeons using it are probably simply using a technique handed down to them in training, or which they have seen in passing. Furthermore, there is insufficient evidence from systematically studied reoperated patients to gauge the efficacy of electrocoagulation of endometriosis. Given that endometriosis can invade several centimeters beneath the visible surface, the use of electrocoagulation violates common sense, since it would truly be a fantasy to imagine that electrocoagulation could treat all endometriosis effectively. In this sense, electrocoagulation of endometriosis converts all disease into superficial disease in the surgeon's mind, since the application of electrocoagulation to endometriosis must be accompanied by some hope that it is completely eradicating all disease. It is unlikely that surgeons are obtaining complete informed consent from their patients before using electrocoagulation of endometriosis, since it is highly unlikely that any woman would agree to a treatment which has never been fully described in the literature, whose efficacy is unknown and which violates common sense. Monopolar electroexcision of endometriosis suffers none of the problems associated with electrocoagulation. The technique has been described in detail in the literature [1, 2, 3, 4, 5, 6, 7, 8, 9]. It is intuitively obvious that excision can treat any manifestation of endometriosis, of any depth of invasion, in any area of the body. Its efficacy has been published . 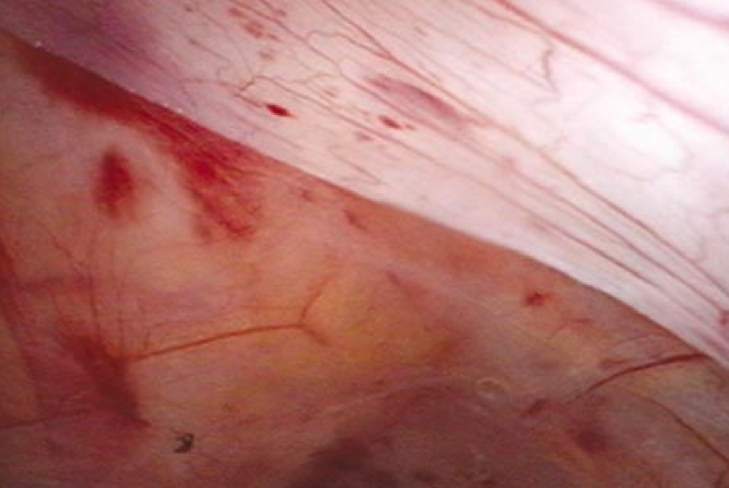 The technique of monopolar electroexcision of endometriosis is based largely simply on blunt dissection with the inactive electrode, separating healthy tissue from diseased tissue. Perhaps 75% of the surgery is performed by blunt or sharp dissection, with electrosurgery used for peritoneal incisions, bleeders, or for severing the remaining tendrils of tissue between endometriosis and healthy tissue. Using electrosurgery in short bursts is another key to its safe use. The higher voltage of coagulation current can cut through almost any tissue with good hemostasis and little lateral thermal spread if the active electrode is moved rapidly. 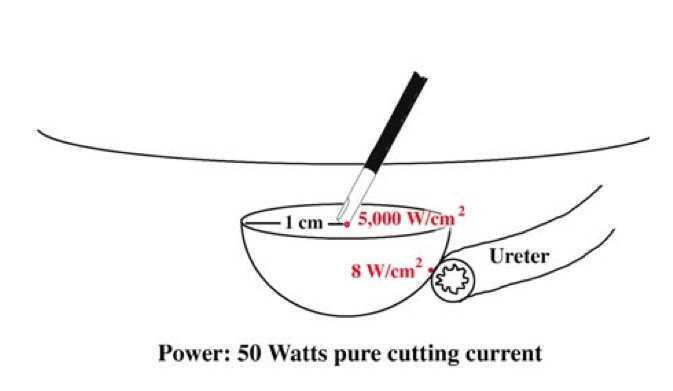 The lower voltage of pure cutting current can cut through vital structures, such as the bowel, bladder or ureter with very little lateral thermal spread (Figure 7). Again, the active electrode must be kept in constant motion. If a 5mm instrument is used the 'footprint' will be larger and the power settings may need to be increased slightly to obtain tissue effects similar to those achieved with 3mm instruments. An additional consideration when using 5mm shafted instruments is that the larger size of the instrument can hide the surgical field from view, leading to imprecise and possibly dangerous surgery. An area of peritoneum involved by endometriosis in the bottom half of the frame has been excised using 90W of pure cutting current. Residual shiny normal peritoneum remains in the top half of the frame. Notice the cut edge which has no sign of lateral thermal spread. While monopolar electroexcision offers many advantages, chief of which is complete removal of endometriosis anywhere in the body, laser excision of endometriosis, by carbon dioxide (CO2), yttriumaluminum garnet (NdYAG), potassium titanyl phosphate (KTP) laser, or harmonic scalpel, offer the possibility of the same complete removal of the disease. Excision of endometriosis is the only treatment that can eradicate superficial as well as invasive disease. Laser vaporization or electrocoagulation cannot be considered equivalent to excision for this reason. Redwine DB. Laparoscopic excision of endometriosis with 3 mm scissors: Comparison of operating times between sharp excision and electro-excision. J Am Assoc Gynecol Laparosc 1993;1:24-30. Redwine DB. Excising endometriosis. OBG Management. Dec 1998;10:24-40. Redwine DB. Laparoscopic diagnosis of endometriosis. Surgery for endometriosis. Operative techniques in gynecologic surgery. Philadelphia: WB Saunders, 1997, Ch 2:58-66. Redwine DB. Non-laser resection of endo- metriosis. In: Sutton CA, Diamond MP (eds) Endoscopic surgery for gynaecologists. London: WB Saunders, 1993:220-8. Redwine DB. Treatment of endometriosis of the cul-de-sac. In: Nezhat CR, Berger GS, Nezhat FR, Buttram VC Jr, Nezhat CH (eds) Modern surgical management of endometriosis. New York: Springer, 1995:105-115. Redwine DB. Surgical treatment of endometriosis by electroexcision. In: Motoshaw ND, Dave S (eds) Endometriosis. Hyderabad, India: Orient Longman, 1997:24-44. Redwine DB. Laparoscopic electroexcision of endometriosis, 2nd edn. In: Soderstrom RA (ed) Operative laparoscopy, the masters' techniques. New York: JB Lippincott-Raven, 1997:105-10. Redwine DB. Monopolar electroexcision of endometriosis. In: Sutton CA, Diamond MP (eds) Endoscopic surgery for gynaecologists, 2nd edn. London: WB Saunders, 1998:369-79. Redwine DB. Laparoscopic treatment of endometriosis. In: Tulandi T (ed) Atlas of laparo- scopic technique for gynecologists, 2nd edn. London: WB Saunders, 1998:77-84. Redwine DB. Conservative laparoscopic excision of endometriosis by sharp dissection: life table analysis of reoperation and persistent or recurrent disease. Fertil Steril 1991;56:628-34.